Earlier this morning I posted a chart from John Sides showing that people didn’t perceive Mitt Romney as any more moderate after Wednesday’s debate than before. That was interesting, but sort of limited. What I was really curious about was how perceptions of Romney as a person changed. Did he seem more or less honest? More or less energetic? More or less plutocratic? Etc. This is, obviously, pretty powerful stuff. It doesn’t tell us whether these changes were mostly due to the debate performances themselves or to the media coverage afterward, but it certainly shows that perceptions of Romney and Obama shifted fairly dramatically. What’s more, as John points out, Romney even gained in people’s perceptions of his honesty. The fact that he tossed out so many specific numbers and plans, and tossed them out with confidence and vigor, apparently made people decide that he must be telling the truth. Obama did a lousy job of making Romney’s deceptions clear. He needs to double down on calling Romney a liar next week. Attacking Romney’s honesty just doesn’t work. No matter how gratifying it might be for us to hear him call Romney a liar, that’s not the key to winning the next debate. My heart says #1 is right, but my head says #2 is right. 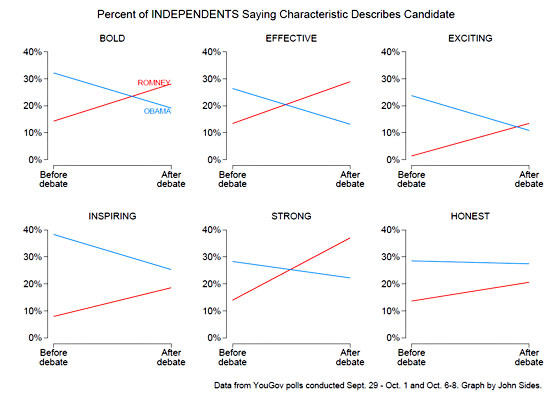 Viewers just tune out when debates turn into a battle of numbers. The key to success lies elsewhere.